What is Maxis Pay and what are the benefits of using it? Why do I need a Maxis Pay account? How do I perform a guest check out? Is there a fee to register for Maxis Pay? I just registered on Maxis Pay but got charged RM 1! How do I know if my Maxis Pay account has been created successfully? Can I use my existing Maxis Pay account? What type of cards do you accept? Can I change or delete my saved card details? Will I be notified if my payment is successful or unsuccessful? Registration and payment is FREE. 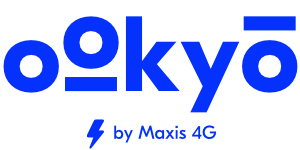 What is ookyo's internet coverage quality?